The complex program of computational and experimental validation of dense fuel for fast reactors in Project Breakthrough provides for testing of fuel rods with mixed uranium-plutonium nitride fuel in the BOR-60 and BN-600 reactors. 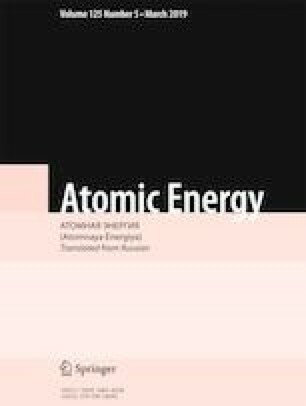 The irradiation parameters and post-reactor studies of the fuel rods of a BREST reactor are presented. Testing of fuel rods in BOR-60 to maximum burnup 5% h.a. and damaging dose 74.8 dpa and in BN-600 to maximum burnup 4.5% h.a. and damaging dose 53 dpa did not result in depressurization of the rods. The results of post-reactor tests of irradiated fuel rods – swelling of fuel, gas release from the fuel, mechanical and corrosion properties of the cladding – are presented. Translated from Atomnaya Énergiya, Vol. 125, No. 5, pp. 278–284, November, 2018.